25 September 2014 - Sod high brow, this show is high WOW! The LORD of the Dance himself brings a new, revamped show to the London Palladium. That’s right, Michael Flately is back in action and ready to bust a move and this time among a host of celebrities, including Nadine Coyle*. In his final West End performance, Flately revives his famed show, Lord of the Dance, but adds a dangerous new element to the piece… expect flames! Lord of the Dance: Dangerous Games has a loose narrative based around Irish Folklore and brings to life concepts of good vs evil via the glorious medium of dance. The show contains electrifying dance sequences that explore themes of darkness, danger, desire as well as love, lust and magic. Complimenting the themes further will be new music by composer Gerard Fahy. Lord of the Dance follows on from Flately’s much famed Riverdance, that put Irish Dancing firmly on the theatrical map following the shows initial performance at the 1994 Eurovision song contest. 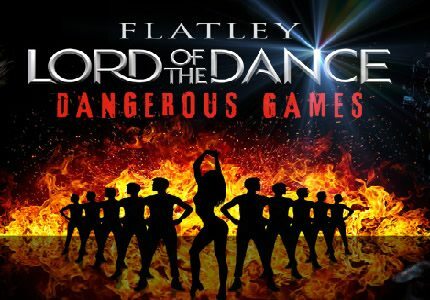 Flatley has written, devised, produced AND choreographed Lord of the Dance: Dangerous Games and is considered to be somewhat of a godlike genius in the world of dance. Lord of the Dance is the definitive jewel in Flatley’s crown and has become one of the worlds top dance spectaculars. Lord of the Dance: Dangerous Games is a dance extravaganza that the whole family can enjoy! Children will love to watch the story unfold through the universal language of movement. Please note that children under the age of 4 will not be admitted into the London Palladium.